The What: WyreStorm recently released its EX-100-4K-PRO, a 4K HDCP2.2 HDBaseT 2.0 extender with dual USB, dual ethernet, two-way control, and two-way PoH for AV and data distribution over distance in education and corporate applications. The What Else: Supporting transmissions of 4K at 60Hz with 4:2:0 subsampling to 100 meters (328 feet) or 1080p at 60Hz with 48-bit color to 150 meters (492 feet), the EX-100-4K-PRO features 5Play compliance for distribution of video, audio, two-way IR/serial control, power, and ethernet along a single Cat-6 cable. 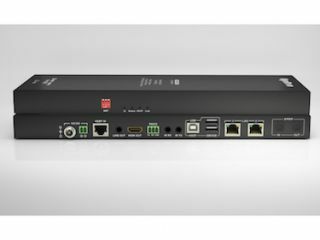 The Bottom Line: Supporting the latest 4K standards yet also backwards compatible with HDBaseT 1.0 transmitters or receivers, the EX-100-4K-PRO is ready for the future 4K deployments in any education or corporate scenario.